No matter how many iPads fly off the shelves, Amazon is determined to keep it’s ebook market share up. Helping them do that is a brand new Kindle DX, and price drops across the board. The Kindle DX now sports a graphite color along with the available white, and the screen has a 50% improved contrast ratio. The best part is the price, however which has dropped to $379 (it was $489 before). The normal-sized Kindle 2 also saw a price drop from $259 to $189. 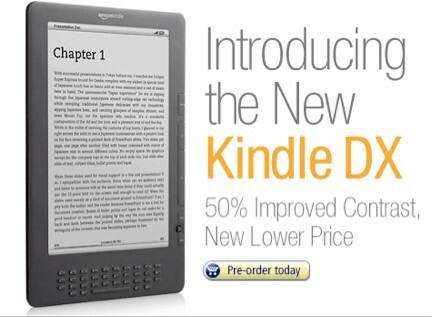 The Kindle 2 is available now, and the new Kindle DX will be available July 7th. Kindle for PC Hits, Mac Coming Soon, Kindle Still Worth It? Amazon released their Beta version of an e-book reader for their Amazon Book Store on desktops today (in beta of course). The app is rather simple, allowing you to read all your purchased content now on your PC (with Mac versions coming soon). But if the Kindle is already on the iPhone, PC, Mac (soon), and with the Nook’s $260 price tag, is the Kindle or Kindle DX really worth the money? Ouch. Sounds like Amazon has some work to do. New York, New York – July 20, 2009 – Barnes & Noble, Inc. (NYSE: BKS), the world’s largest bookseller, announced today the launch of the Barnes & Noble eBookstore, the world’s largest eBookstore, on Barnes & Noble.com, enabling customers to buy eBooks and read them on a wide range of platforms, including the iPhone and iPod touch, BlackBerry® smartphones, as well as most Windows® and Mac® laptops or full-sized desktop computers. In addition, Barnes & Noble announced that it will be the exclusive eBookstore provider on the forthcoming and much anticipated Plastic Logic eReader device. · Barnes & Noble’s eBookstore offering its customers seamless access to more than 700,000 titles, including hundreds of new releases and bestsellers at only $9.99, making it the world’s largest selection of eBooks available in one place. The company expects that its selection will increase to well over one million titles within the next year, inclusive of every available eBook from every book publisher and every available eBook original, which is a fast growing marketplace. · An upgraded version of its eReader application, which was part of the company’s Fictionwise acquisition earlier this year. This device-agnostic eBook application supports both wireless and wired access to the new Barnes & Noble eBookstore. Millions of internet-enabled devices are currently supported by eReader, including the nation’s two leading smartphone device families from Apple and BlackBerry®, as well as most Windows® and Mac® laptops or full-sized computers. · First-time users of the eReader will have the opportunity to download free eBooks, including titles such as Merriam-Webster’s Pocket Dictionary, Sense and Sensibility, Little Women, Last of the Mohicans, Pride and Prejudice, and Dracula. See site for further details. · The free, full-featured B&N Bookstore app for iPhone and iPod touch users, which is now the #1 downloaded book app in Apple’s App Store. In addition to enabling customers to easily place orders for books, movies, and CDs, the app also lets users search millions of products simply by snapping a photo. Using the iPhone’s camera, customers can snap a photo of the front cover and within seconds get product details, editorial reviews, and customer ratings – even find and reserve a copy in the nearest store. The app also includes a store locator, bestseller lists, book recommendations, and a store events calendar. Minor Headlines That Make You Think . . . Seems like even the greatest of tech companies have EVIL lurking in them somewhere. Just like Amazon. They are taking 70% of profits from the subscribe-able newspapers. Does this mean the most popular of newspapers can even exist? THINK. Even so, after all the lawsuits, it seems that Psystar is working on a Mac OSX netbook. Do these guys not get that fact that what they’re doing is illegal??? Come on, really? THINK. Not only that, but Trent Reznor can now sleep peacefully now that Apple has approved his app once again. Is Apple not a consumer friendly company? Could he and all his money possibly spoken to Apple about this mistake? Guess not. Great way to handle it. On a lighter note, AT&T might be considering a $10 decrease in iPhone plans. The price would drop from $69 to $59. How long did it take them to figure out that a lot of people can buy the iPhone, but can’t afford the plan? Say hello to the jail breakers. They released their newest e-book reader titled the “Kindle DX” features a 9.7 inch screen, holds 3,500 books, and can read PDFs thanks to the new built in feature.